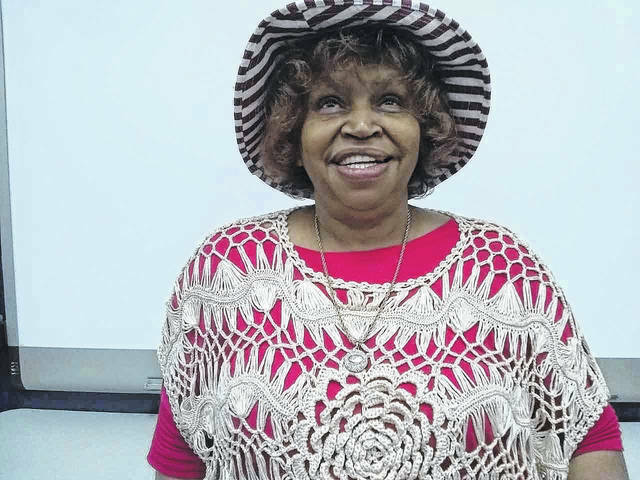 Nellie Ruby Taylor, pictured, recently spoke at a meeting of the Point Pleasant Writer’s Guild. POINT PLEASANT — “Did you know that everyone writes?” asked Nellie Ruby Taylor as she began her presentation on writers and the resources they need to make themselves better writers. To write, the first thing a writer must have is “inspiration,” that invisible something that moves a person to write. Like the wind, we cannot see inspiration, but we can witness its work in the finished book, poem, song, essay or play which has been fueled by the author’s imagination. A good writer brings a story to life by using the five physical senses (seeing, hearing, feeling, smelling, and tasting) when describing a scene to the reader. They do not just “tell” about it. Ruby listed several resources of which good writers should avail themselves. For example, always keep a dictionary, not only for its definitions and spelling, but for its lists of symbols, holidays, and a myriad of other useful facts. Also, she added, the Bible uses excellent grammar and punctuation. Another necessity for writers is a thesaurus, which gives alternate word choices to say exactly what you want to say. As for newspapers, they are an education in themselves. Using books that relate to your subject is another good idea. Be inspired by good movies, like her favorite “The Ten Commandments” and a more recent one, “The Bucket List,” for instance. “Radios,” she added, “are great for learning to enunciate your words.” Ruby has written and given many speeches pertaining to U.S. history, so she knows how important enunciation is. She informed her listeners that on the radio of earlier years, the program “Amos and Andy” had white men speaking like black men. When the popular show went on television, actual African American actors had to be used for the roles. Radio and books have that in common – the listener, or the reader, must use their imagination to give certain features to the characters that people their unseen world. Ms. Taylor urged those present to listen to speeches by great men and women, men like Martin Luther King who had the ability to talk to anyone at any level. She quoted King Solomon who said, “A word fitly spoken is worth apples of gold in pictures of silver.” Continuing with resources, Ruby reminded the group that libraries offered more than just books. They also have movies, music, genealogy, photos, videos, and art displays. Ruby’s advice, “Be the architect of your own book.” She shared a book which she had had published, laid out like a newspaper, using lots of white space which allows the reader to follow the individual articles more easily. Patrecia Gray, leader of the Writers Guild, presented Ms. Taylor with a card and gift in appreciation, after which everyone took a small break and enjoyed some refreshments. When the meeting resumed, the floor was then opened up to members of the Writers Guild who had something to share. Marilyn Clarke read a poem her mother had written. Although it had no title, the first line read: “I think it’s not for us to know why old men live and young ones go.” In the discussion that followed, it was determined that the poem was probably written in memory of Marilyn’s uncle who had lost his life in the Philippines during WWII. Sue Underwood read a poem she had written about the flight of an eagle with its singing wings and shifting eyes. In addition to Ms. Taylor, those present included: Sue Underwood, Feryle Lawrence, Max Price, Marilyn Clarke, Carol Newberry, Patrecia Gray, April Pyles, and guests Desi Penick and Donna and Phillip Heck. The Point Pleasant Writers Guild meets the first and third Wednesdays of each month from 1 to 3 p.m. at the Mason County Library. All aspiring writers are invited to attend. There is no charge for membership. This article is a supplement to the “Generations” special pages inside this edition which begin on page B2, dealing with issues important to those of retirement age. https://www.mydailytribune.com/wp-content/uploads/sites/42/2018/04/web1_4.12-Taylor.jpgNellie Ruby Taylor, pictured, recently spoke at a meeting of the Point Pleasant Writer’s Guild.